MaMa thought it would be fun to start taking on the Daring Baker's Challenge each month. 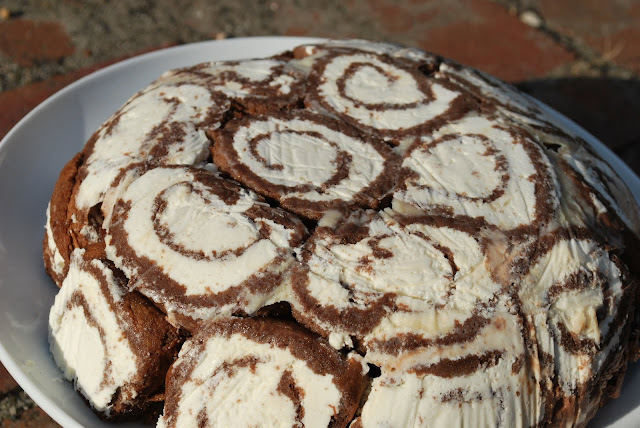 This month's challege was a Swiss Roll Ice Cream Cake and I'll tell you, it was delicious. MaMa had a few technical difficulties that effected the appearance of the cake, but nothing was wrong with the taste, that's for sure! As you can probably tell, the one side of the cake got a little squished. This is because we have a side-by-side refridgerator and it just wasn't wide enough for the bowl to sit in there straight, so the downhill side looks a little smooshed. But like I said, it still tasted great! MaMa's twist to the challenge was that she made the swiss rolls with Joseph's Grainery Soft White Wheat Pastry Flour instead of the all purpose flour that the recipe called for. It worked great! 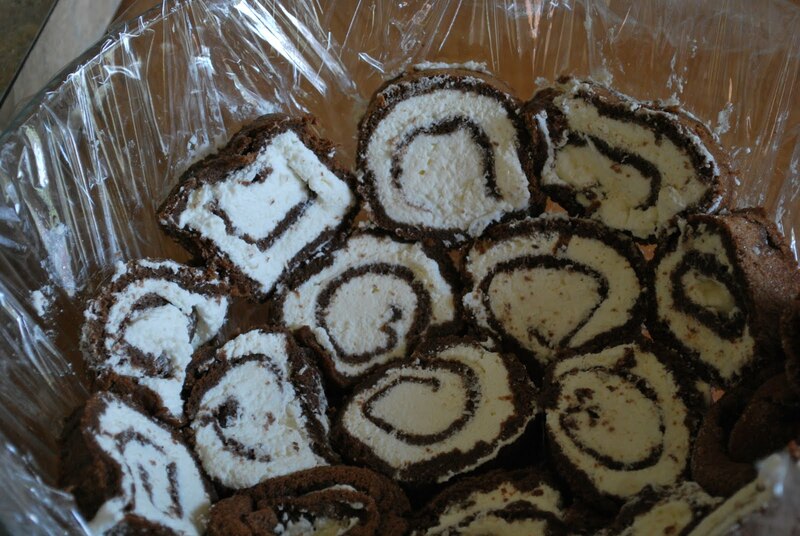 The swiss rolls turned out beautifully. Preheat the oven to 400 degrees. Brush two 9x13 paking pans with oil and line with greaseproof baking paper. In a large bowl beat the eggs and sugar until very thick. Then fold in the flour and cocoa in gradually. Fold in the water. Divide the mixture between the two baking pans and bake for 10-12 minutes. Spread a kitchen towel on the counter and sprinkle a little sugar over it. Turn the cake on to the towl and peel away the baking paper. Roll the cake up in the towel. Cool the wrapped roll on a rack, seam side down. Do this for both cakes. In a medium bowl beat together the cream, vanilla and sugar until very thick. Divide the cream mixture between the two cakes. Open the rolls and spread the cream mixture. Roll the cakes up again (without the towel), wrap in plastic and chill in the fridge till needed. 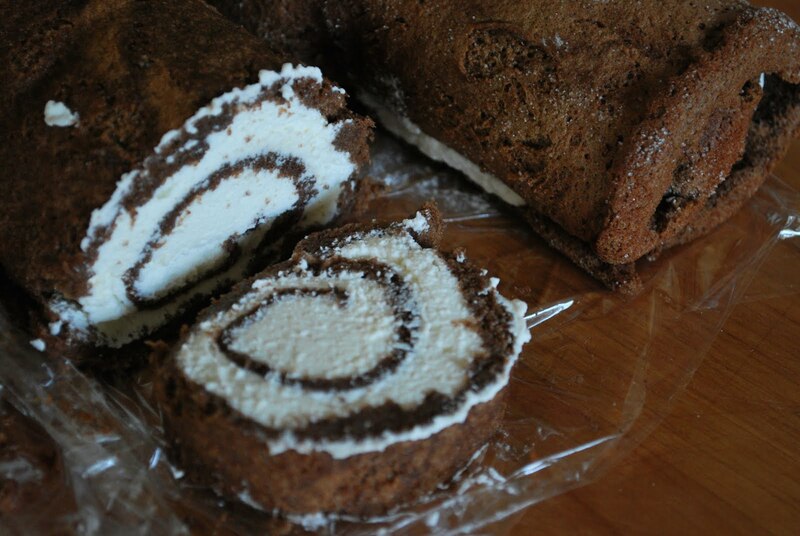 To assemble the cake, cut the swiss rolls into slices about 2 cm thick. Cover the bottom and sides of a large bowl, in which you'll set the dessert. Arrange the slices at the bottom of the bowl and up the walls. Cover with plastic wrap and freeze until the slices are firm. 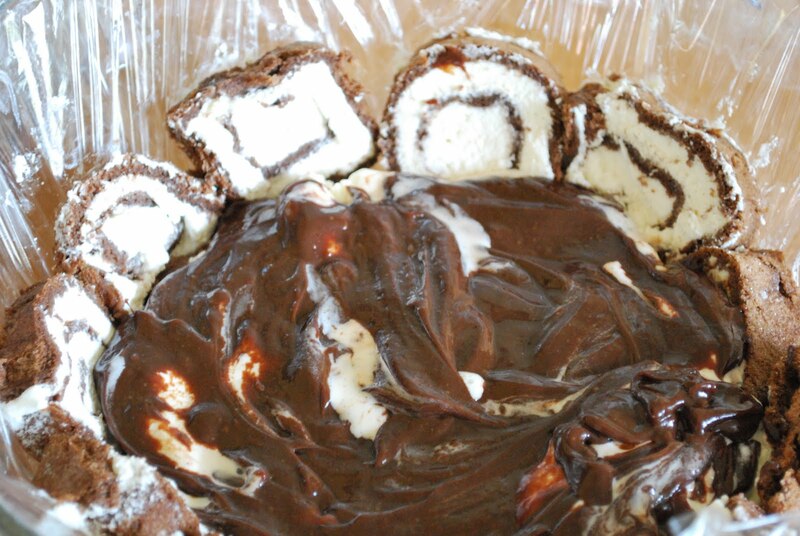 Spread the vanilla ice cream over the slices of swiss roll, then spread the hot fudge and then the chocolate ice cream. This photo shows the hot fudge layer over the vanilla ice cream...yumm! Cover with plastic wrap and freeze for at lest 4 hours until completely set. Remove the plastic cover and place a serving plate on top of the bowl. Turn it upside down and remove the bowl and plastic lining.